Ok, it's Fall y'all! And what does Mom CRAVE when it gets cold....(No..not everything!) SOUP! This is one of the BEST if not THE best baked potato soup recipes I've found. And even more exciting?? I played with it and found a way to make it just a tad bit healthier! To my credit...the fam loved it more than my other super fattening almost as delicious soup. This is going to be my new go-to from here on out! 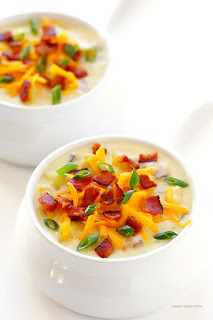 Add bacon, 5 cups chicken stock, potatoes and onion to the bowl of a large slow cooker, and stir to combine. Cook on low for 6-8 hours or on high for 3-4 hours, or until the potatoes are completely tender and cooked through. Once the soup has slow cooked and is about ready to serve, cook the butter in a small saucepan on the stove over medium-high heat until it has melted. Whisk in the flour until it is completely combined, and then cook for 1 minute, stirring occasionally. Gradually add in the evaporated milk while whisking it together with the flour mixture, and continue whisking until the mixture is completely smooth. Let the mixture continue cooking until it reaches a simmer, stirring occasionally, and then it should get really thick. Immediately pour the milk mixture into the slow cooker with the potatoes, and stir until combined. Add in the cheddar cheese, Greek yogurt (or sour cream), salt and pepper, and stir until combined. If you would like the soup to be even thicker, you can use a potato masher or a large spoon to mash about half of the potatoes (while the soup is still in the slow cooker) to thicken the soup up. If you would like the soup to be thinner, add in an extra 1-2 cups of warmed chicken or vegetable stock. Stir to combine, then taste and add more salt and pepper if needed. Okay...sharing these straight from my new BFF's...all six of the sisters from Six Sisters stuff. (Now that was a mouthful to say). Seriously some of the best gals you'll ever meet and some of the best food you'll ever eat! 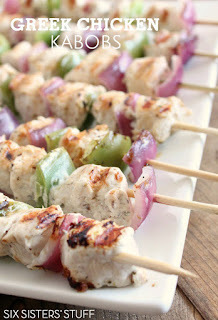 These kabobs are the bomb and they were gone in minutes so I'm leaving them riiiiiight here so I can find them quick! And it's great with Tzatziki Sauce!!! MMmmm! In a large ziploc bag, place chicken, yogurt, greek dressing, lemon zest, lemon juice, salt, and oregano. Zip and mix with your hands. Refrigerate for 2-4 hours. If you are using wooden skewers, soak them water for up to 30 minutes before grilling to prevent them from burning. After meat has marinated, slide alternating pieces of meat, onion, and green pepper onto skewers. Heat grill to medium-high heat and grill for 8-10 minutes, or until chicken is no longer pink and the juices run clear. Strain yogurt using a cheesecloth over a bowl (if you don’t have that, a strainer lined with a coffee filter will work) fora couple of hours (I let mine strain for about 6 hours) or overnight to get out as much moisture as possible (I know that this step sounds funny, but I promise that if you don't do it, your sauce will be runny and not as delicious). Mix together the strained yogurt, shredded cucumbers, garlic, vinegar and lemon juice. Add salt and pepper to taste. Keep in the fridge until serving (let the flavors come together for about 30 minutes before serving). This is definitely one of our new fam faves! 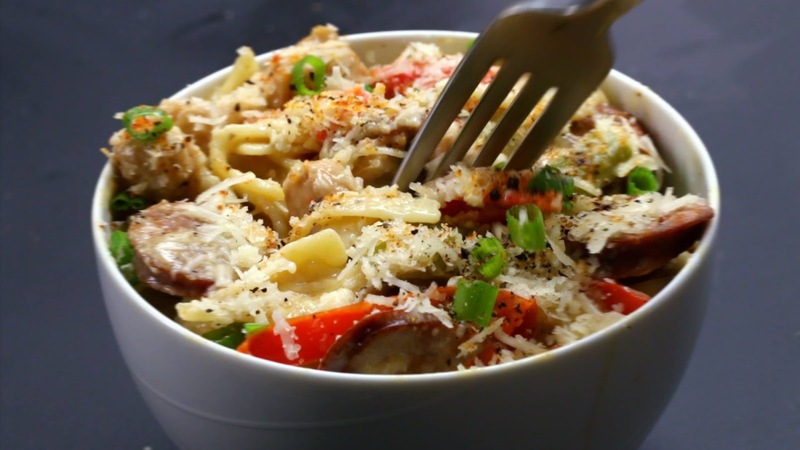 Easy breezy delicious...and best of all you only need to mess up one pan! Fast and delicious! Spice up your life and give it a try!